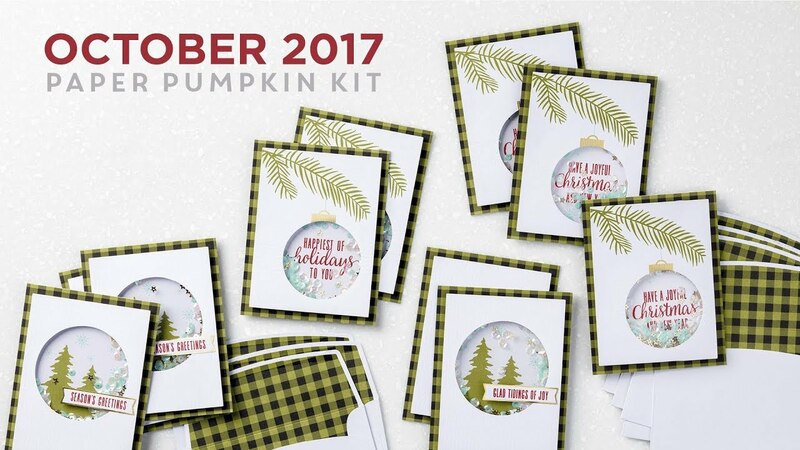 I'm a big fan of the Paper Pumpkin kit by Stampin Up. I really love the all-inclusive kit but my favorite thing is to create an alternative. This wine tag was using the stamp set from the October 2017 paper Pumpkin kit. 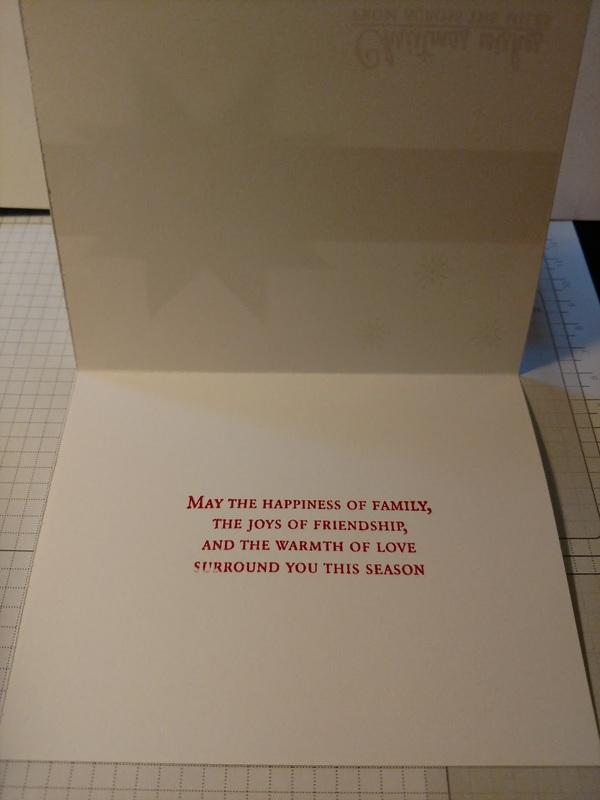 I know you would love to use this tag to brighten someone's holiday season. The Stamparatus by Stampin Up "A New Way of Stamping"
The global launch will feature three pre-order reservation windows. 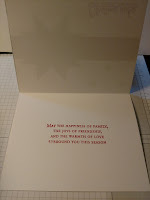 Click here to Reserve your Stamparatus on November 16th, if you don't have an online account with Stampin Up you will need to create this first. Click here for instructions to complete your reservation. Last year in October Stampin up had a Designer Series Paper promotion and I purchase several packets. When the new annual catalog was launched this year most of the designer paper was put on the retired products list. I really love the colors in this paper so I decided to use it for these cute hand sanitizer holders. These holders make great gifts for teachers, co-workers or stocking stuffers. The idea for this project came from Amy Bailey Waltrip but I changed it up to incorporate one of the Paper Pumpkin stamp sets. 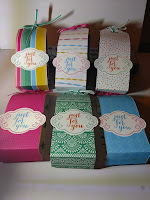 Cut DSP 2' x 11", Score@ 5" & 6"
Stamp image and sentiment on whisper white card stock using the Label me pretty stamp set. Once all the stamping is completed punch out label using the Pretty Label Punch. Attach label to holder using the tear and tape adhesive. Insert hand sanitizer and close top with ribbon. *Tip I put glue dots on hand sanitizer to hold it in place*. I love these vibrant colors but this DSP is retired, If you would like create this project go to my online store and check out the new designer series paper. I would love to see what you create. If you would like to learn how to make this and other cute projects join my team. I promise you hours of unlimted crafting fun. Event details is listed on my calendar. Craft Show Goodies #1 featuring "Stampin' Up Products"
On December 2, 2017, I will be a vendor at the St. Rose of Lima Holiday Market. Last year was my very first time and it was awesome. Over the next couple of weeks I will be sharing some of the goodies I've created . 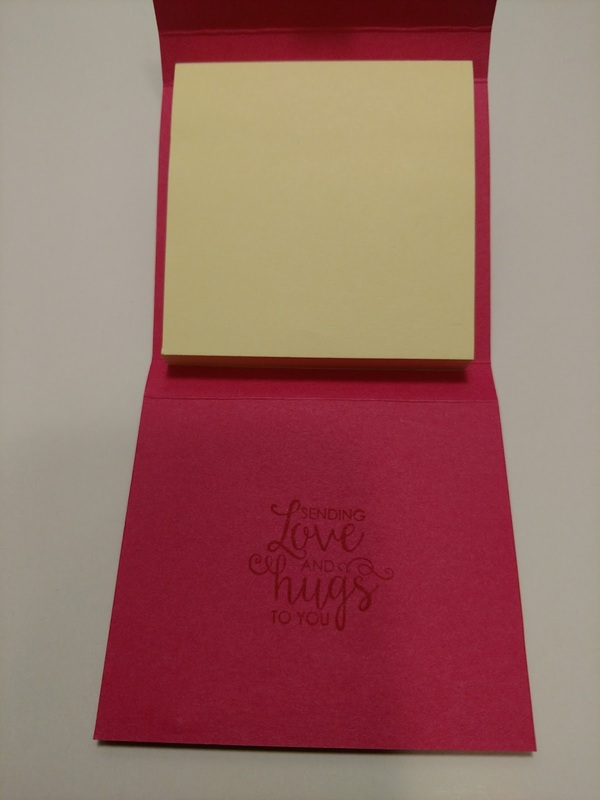 The first item is the cute little post-it note holder with pen. This is the perfect gift for a teacher, co-worker or even a secret Santa. Post Note Holders with pen. 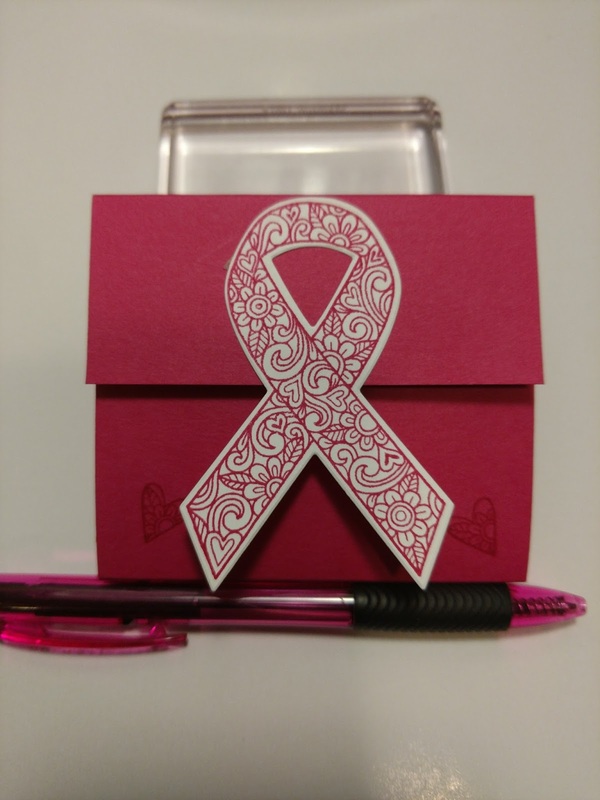 The inspiration for this cute little Post-it Note holder came from Lisa Ann Bernard of Queen B Creations. 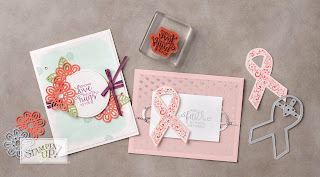 I cased her project but featured the Ribbon of Courage Bundle from Stampin' Up! This bundle is my favorite from the annual catalog. 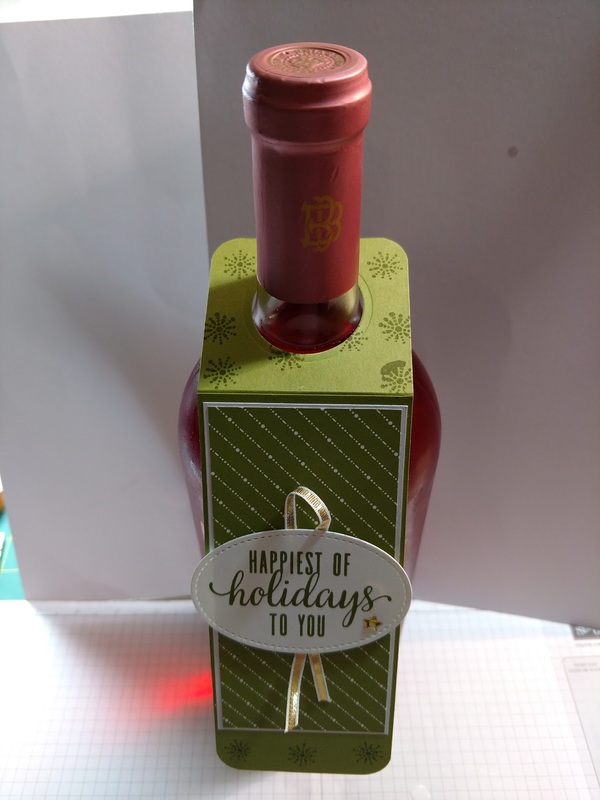 Using the paper trimmer cut the melon mambo cardstock 8.5" x 3.5"
score@ 1.5", 2', 5" &5.5"
Stamp ribbon image on whisper white scrap and die cut ribbon using the Support Ribbon Framelit dies. 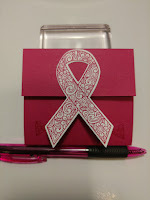 Choose a sentiment from the Ribbon of Courage stamp set and stamp in on the inside as shown in the picture. I chose to do the tone on tone stamping technique. Take your bone folder and crease the score marks. 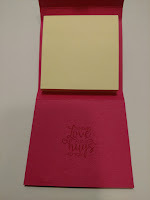 Attach the post-it note to the inside of holder using the tear and tape adhesive. Close holder and attach ribbon die cut to the top as shown in the picture. To make sure the velcro dots are correctly aligned remove backing and attach to back of top flap. Remove back from bottom of velcro dot and close holder. This technique will attach the velcro dots to the holder correctly. Woohoo your holder is complete. Craft Show Goodie #2 will be posted in the next couple of days. If you would like to learn how to make this and other cute projects join my team. I promise you hours of unlimted crafting fun. 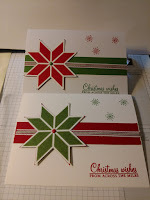 Christmas Wishes featuring Quilted Christmas Designer Series Paper Images©Stampin' Up! This month I'm in two different card swaps. The theme was Christmas, New Year's or Winter. 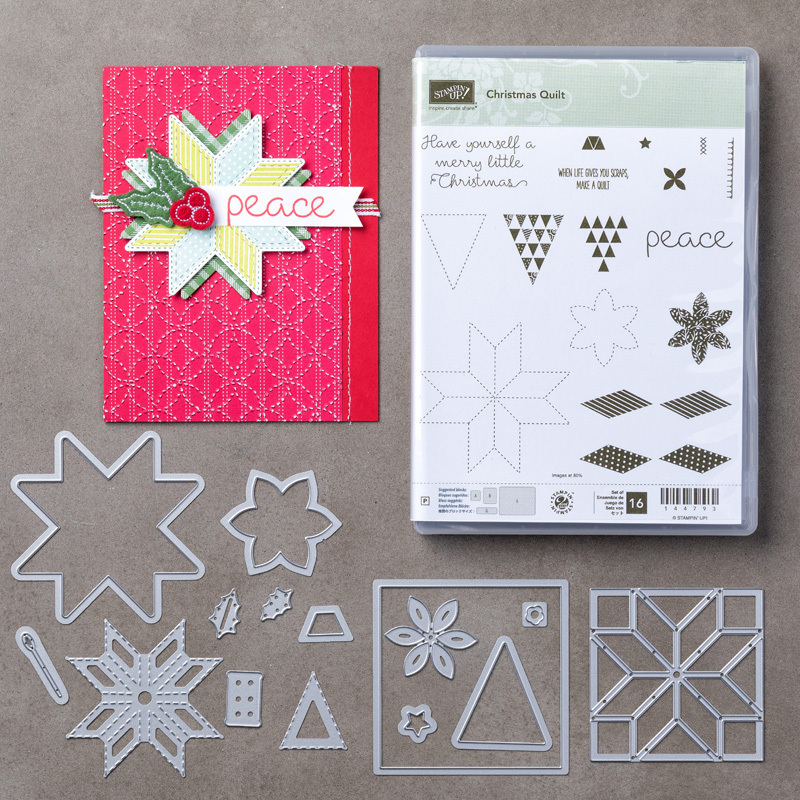 I chose Christmas because I really love Stampin' Up's Christmas Quilt designer series paper. 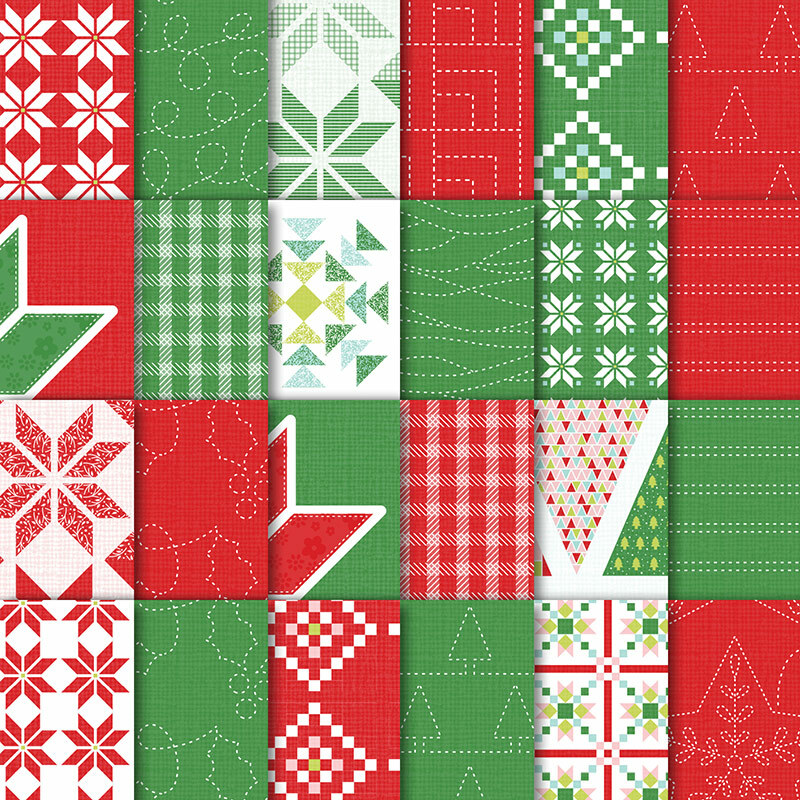 As you can see this this paper is part of the Quilted Christmas Suite. I really love how these cards turned out. You will notice a little color on the tips of each star, I achieved this effect by fussy cutting each star. Christmas Wishes from across the miles! Cut whisper card stock 8.5" x 5.5", score@ 4.25"
Cut garden green card stock 1" x 5.5"
Stamp sentiment on bottom right hand corner of card base and stamp verse inside card. Attach cardstock strip to card base using fast fuse. 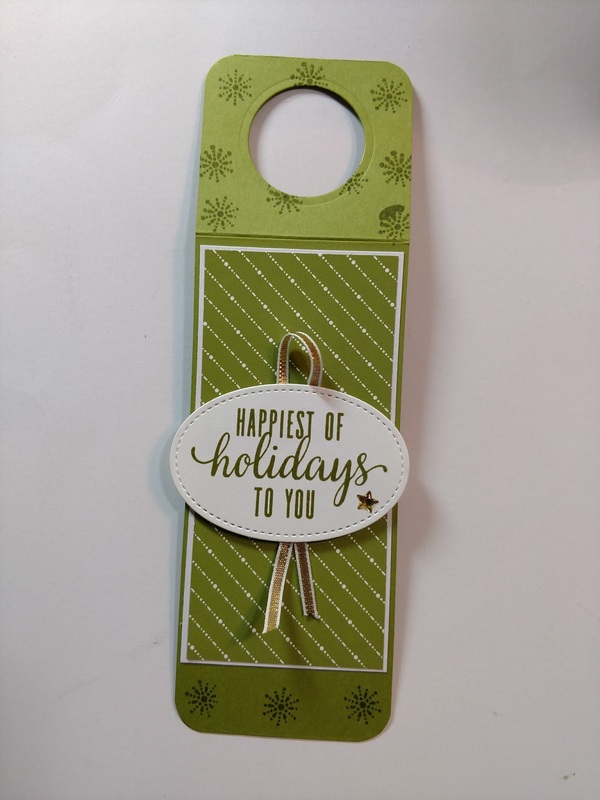 Attach ribbon to cardstock strip using mini glue dots. 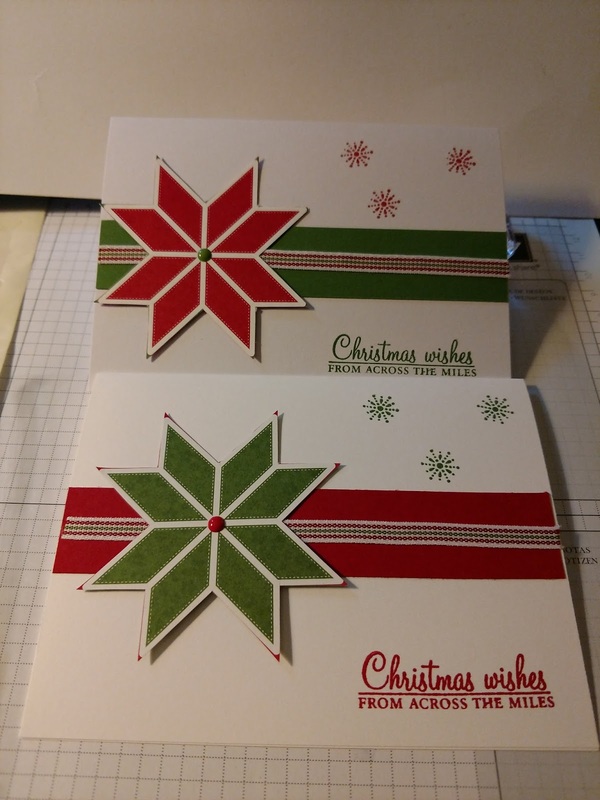 Using fast fuse attach star to card stock and ribbon layer. To give your star that extra pop add a bright enamel shape. I wanted to bring in more color so I added three star images using the stamp set from October 2017 Paper Pumpkin Kit, "Pining for Plaid". I really love how those stars made everything on the card tie together. As you can see this is a quick and simple card. If you're not a big fan of fussy cutting you could always get the Quilt Builder Framelits Dies.